This past 2 weeks had been busy that I was not able to write and upload posts that I originally intended to.Â On one hand I feel disappointed with myself for not staying on target with the goals of this blog, on the other hand I feel good that I have exhibit the spirit of aloha and the essence of ohana this past 2 weeks.Â You see, our dear friends, the Sowers, stayed with us for 10 days while visiting Maui.Â They used to be our neighbors but they moved to Washington State a couple years ago (work related). We love these friends of ours and we are happy to shareÂ our home with them – and that’s the spirit of aloha and essence of ohana I am talking about. We were sad to see them leave last night, and told them to come visit us again soon. One of the nice things about having friends over from other States (or countries) who are visiting Maui is that we get to do “touristy” of “vacationy” stuff with them.Â I think one draw back of living on Maui is sometimes we tend to neglect to enjoy the beauty of the island, just because we are so busy working and earning a living.Â When friends are here on vacation, we disruptÂ our usual daily routine and enjoy time with our friends, going to the beach, or mountain, or just hanging out pau hana style in our pool.Â And we did a lot of that this past 10 days and it was good. Aside from hanging out with our friends, there are also other “happenings” that kept me busy this past weeks. One of them is that we adopted an italian greyhound puppy; and then 7 days after we had to take him to the vet because he was sick, so sick that he had to stay in the vet clinic for a couple of days.Â I willÂ create a separate post about the vet visit but I just want to mention here how our veterinarian, Dr Kheeler, was so great in taking care of our little pup Sonny, that he too had shared with us the spirit of aloha. Today is Presidents Day. A holiday for many. 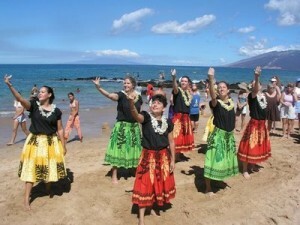 Our church, Hope Chapel Maui, is going to have a Beach Baptism at Kamaole Beach III.Â I will go there to support our “church ohana”.Â It will be a fun time.Â I will take some photos and share it here.Â How about you? What are your plans for today? When and how are you celebrating your Presidents Day holiday? ← Honolulu Twestival Raised $6,000 for Charity:Water! Sounds like you have been busy!